The Four of Pentacles depicts a royal miser who is tightly hanging on to the four pentacles he possesses. One is balanced on his head, one he holds against his chest and the last two are tucked beneath his feet. This card is usually described as showing someone who is ungenerous and has an inability to share – money, attention, people, attitudes, energy, or position. Expanding Dimensions modernized this idea into the Four of Earth which shows an affluent woman admiring herself in a mirror. 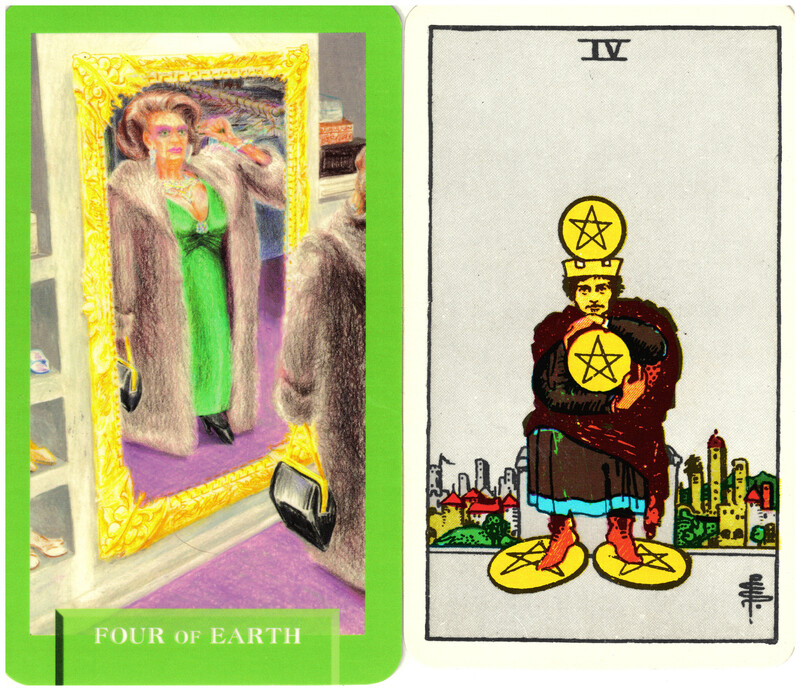 It suggests the same ideas as the Four of Pentacles: there is nothing wrong with material wealth as long as we remember to see beyond our own needs and do not hoard what we possess. The reflection the woman sees in the mirror is only her outward appearance – but that may be all she ever sees.